Just weeks ago, Samsung hosted its Unpacked event, unveiling the Galaxy S10 lineup. But, at the time of the event, little was known about the offering, save for the fact that it was named the “Blockchain Keystore,” which would store keys for blockchain-enabled mobile applications. In the days that followed, however, details and images reached media claiming that Keystore was actually a fully-fledged crypto wallet that supported Bitcoin, Ethereum, and potentially ERC-20 tokens. Yet, a pre-release/early-release version of the device sent to a Youtuber going by Jorozu was revealed to only support Ethereum, not even the flagship cryptocurrency. In a nine-minute video, Jorozu unboxed the device, which seems as bonafide as can be. He drew attention to Keystore on his device, seemingly the Korean release rather than the international release, and showed it depicting an Ethereum transaction’s information. Funnily enough, however, when Jorozu opened Keystore, he was greeted with a visual representation of Bitcoin, but still claimed the offering only supported Ethereum out of the box. Interestingly, this isn’t the first time that wallet providers have seemingly opted to support Ethereum before its ‘father’ in Bitcoin. Opera, the popular web browser, only supports Ether and ERC tokens on its built-in wallet. This is likely due to Opera’s centricity on Internet applications, with Ethereum being a much more popular platform for DApps than Bitcoin. Moreover, Coinbase Wallet (different than Coinbase.com), formerly known as Toshi, just recently added support for Bitcoin, Litecoin, among a few other assets, after supporting Ethereum and tokens on the ‘world computer’ blockchain for over a year. How About Cosmo And Enjin? Interestingly, the Youtuber that recorded this video made no mention of Cosmee and Enjin either, two other digital assets reported to play a role in Samsung’s first consumer-facing cryptocurrency offering. 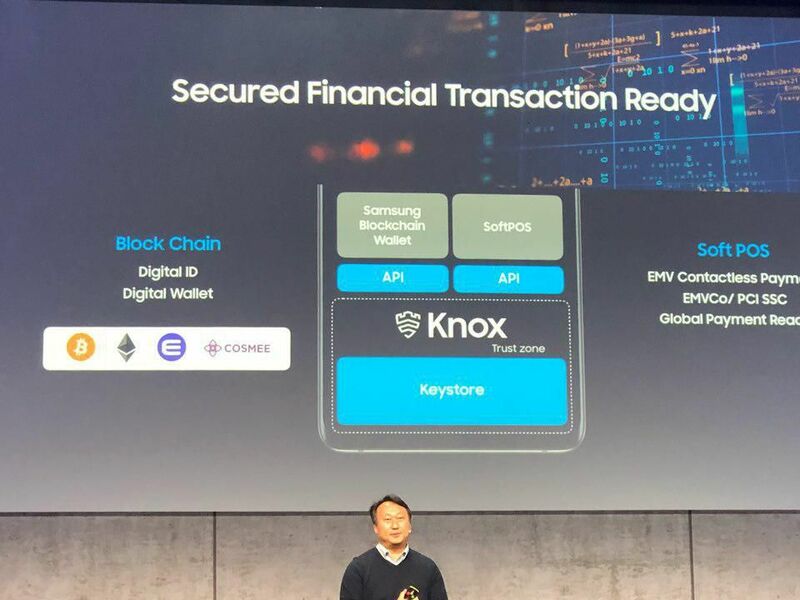 For those who missed the memo, at the Mobile World Congress in Barcelona, Samsung took to the stage to reveal that its S10 devices are “financial transaction ready,” and would support cold storage for Enjin (ENJ), Cosmee (COSM), and the two aforementioned. Considering the fact that official Samsung representatives have expressed approval to the aforementioned altcoins, the lack of support for COSM and ENJ may just be temporary or region-locked. Per statistics gathered by Flipper, a real estate developer by trade but Bitcoin lover by night, Samsung shipped 70 million units in Q4 2018 alone. All the devices shipped likely weren’t flagships. But, considering the popularity of Galaxy devices, it wouldn’t be nonsensical to claim that a minimum of 25 million individuals will pick up S10 smartphones over the course of the coming year. Even if this offering isn’t actively used by common Joes and Jills with S10s in their pockets, White Rabbit, a long-time Bitcoin miner & respected investor, remarked that custody (security) remains one of the largest problems facing this space today. And as such, he determined that the introduction of proper security solutions, like KeyStore, could be “interesting” to watch in the coming months and years. Alec Ziupsnys, better known as Rhythm Trader on Twitter, noted that Samsung’s latest move in the blockchain realm should spark competition from Apple and Google, thus catalyzing adoption even further.